No doubt about it, Raleigh proved to be my favorite Bouchercon ever—simply put, a blissfully fun homecoming. The fun actually began before Bouchercon officially kicked off, with a pre-conference event on Wednesday, October 7, at Quail Ridge Books. 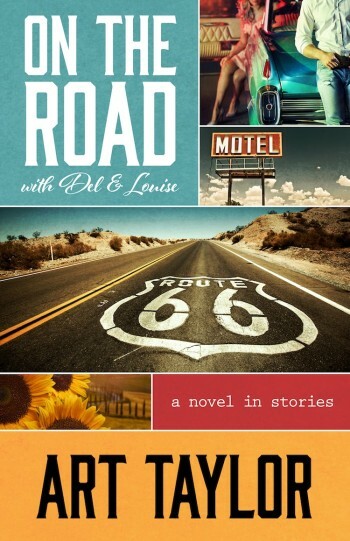 For me, the evening was essentially the North Carolina book launch of On the Road With Del & Louise: A Novel in Stories, and I was thrilled to be joined by Susan M. Boyer, a good friend whose Liz Talbot mystery series is also published by Henery Press. It was fun to see so many old friends at the reading, particularly those associated with several chapters of my life in Raleigh: folks from my days at Spectator Magazine, from my time the North Carolina Museum of Art, and from my first stint in grad school at NC State University. 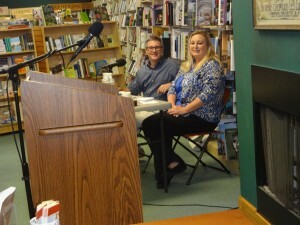 And as I pointed out, homecoming in one respect (those friends and others, and my family in the audience) was matched by talk of home in another sense—with Susan Boyer part of the close-knit publishing family at Henery Press. Later that night, I spent time with another HP author, Annette Dashofy, adding bookmarks and candy to swag bags for the author speed dating on tap the next morning (and snuck a few pieces of candy myself, I have to admit). That author speed dating seemed to set the tone of the entire weekend—high energy, a frantic pace, equal parts dizzying and invigorating, and all those layers of fun connecting writers with readers and writers with writers too. I attended several fine, fun panels over the course of those four days, including a chat on traditional mysteries that featured Dorothy Cannell, Terrie Farley Moran and Marcia Talley; an examination of social media with Deborah Lacy, Dru Ann Love, and Janet Rudolph; a talk on navigating your TBR pile with Ellen Clair Lamb and Matt Iden; the Jewish Noir discussion led by anthology editor Ken Wishnia; the local guest of honor panel that not only featured the guest of honor herself, Sarah Shaber, but also fine writers John Hart and J.D. Rhoades, under the skillful moderation of Molly Weston; the Hammett panel with Julie Rivette, Richard Layman, and Peter Rozovsky; and then my own panel Sunday morning, with fellow short story writers Barb Goffman, Gigi Pandian, and John Shepphird—a discussion that left me with fresh perspectives and new energy myself. Undoubtedly, however, four moments stood out as personal highpoints. First, it was a great honor to present for the first time the new medals honoring winners of the Derringer Awards. Jan Christensen, president of the Short Mystery Fiction Society, and Gerald So, the organization’s long-time guiding light and most devoted supporter, led the way over the past year to finalize the form that the medal would take, but since neither of them could attend, they tapped me to formally present them at Bouchercon’s opening ceremonies to the winners of this year’s Derringers Awards: Joseph D’Agnese, best flash story, for “How Lil’ Jimmie Beat the Big C” from Shotgun Honey; Cathi Stoler, best short story, for “The Kaluki Kings of Queens” from Murder New York Style: Family Matters (accepted by Kathleen Ryan); Hilary Davidson, best long story, for “A Hopeless Case” from All Due Respect; Doug Allyn, best novelette, for “The Snow Angel” from Ellery Queen’s Mystery Magazine (accepted by Janet Hutchings); and James Powell, recipient of the Edward D. Hoch Memorial Golden Derringer for Lifetime Achievement (also accepted by Janet Hutchings). As an added bonus: What fun was it to get together with so many members of the Short Mystery Fiction Society for lunch the next day—a chance for many of us to meet and mingle with folks we’ve only known online. 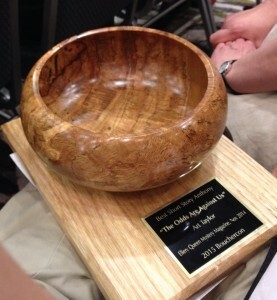 And congrats too to Craig Faustus Buck, a fellow SMFS member who took home the Macavity Award for Best Short Story at the opening ceremonies for his tale “Honeymoon Sweet” from last year’s Bouchercon anthology, Murder at the Beach. 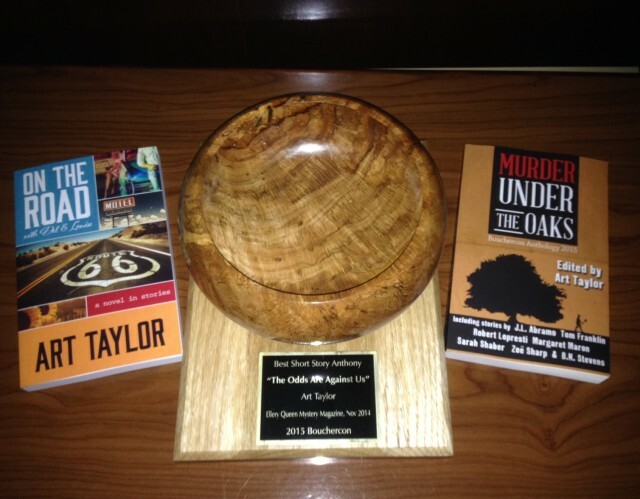 ….which brings us to the second highlight for me: the launch of this year’s Bouchercon anthology, Murder Under the Oaks, which it was my great privilege to edit. Nineteen of the collection’s 21 contributors showed up for the launch event Saturday morning, talking briefly about and reading short excerpts from their individual stories to give a standing-room-only crowd some previews of what to expect—stories that ranged from traditional whodunits to edgier noir tales and featured a little bit of everything in between. 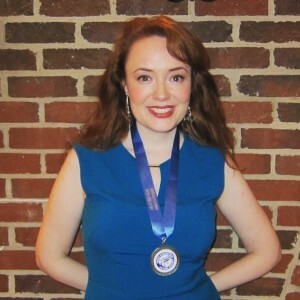 Participants included (in order of appearance in the anthology): Margaret Maron, P.A. Da Voe, Karen Pullen, Lori Armstrong, Karen Salyer, Robert Mangeot, J.D. Allen, Zoe Sharp, J.L. Abramo, Tom Franklin, Britni Patterson, Sean Doolittle, Rob Brunet, Kristin Kisska, B.K. Stevens, Graham Wynd (Kate Laity), Sarah Shaber, Toni Goodyear, and Robert Lopresti. Highpoints within this highpoint: Helping Kristin Kisska and Karen Salyer celebrate their very first day as published authors! 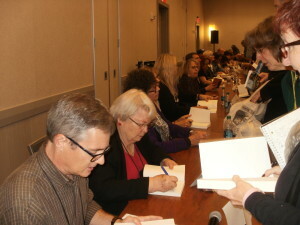 And then seeing that long signing line—with nearly 300 books coming across our table before the event was done. Third highpoint: Learning that the Bouchercon book room had sold out of my own book! When I stopped in Thursday morning to see if anyone was even carrying On the Road With Del & Louise, I was surprised to find three large stacks of those paperbacks at Scene of the Crime’s tables as part of a display of Henery Press titles. Even more surprising was stopping by Friday morning to find only a single copy left! I’ll admit it: When I first saw those three big stacks, I anticipated how sad it would be when none of them sold, and when I came back and saw the piles gone, my first thought was that they’d just moved them behind the table somewhere, tucked them away to make room for other titles that people might actually be interested in. So I was stunned, to say the least, by the news that so many readers were actually picking them up—on purpose and everything—and grateful later to Quail Ridge Books who brought over some of their extra stock on Sunday for readers still searching out copies. And speaking of “stunned,” a final moment from Bouchercon’s closing night. 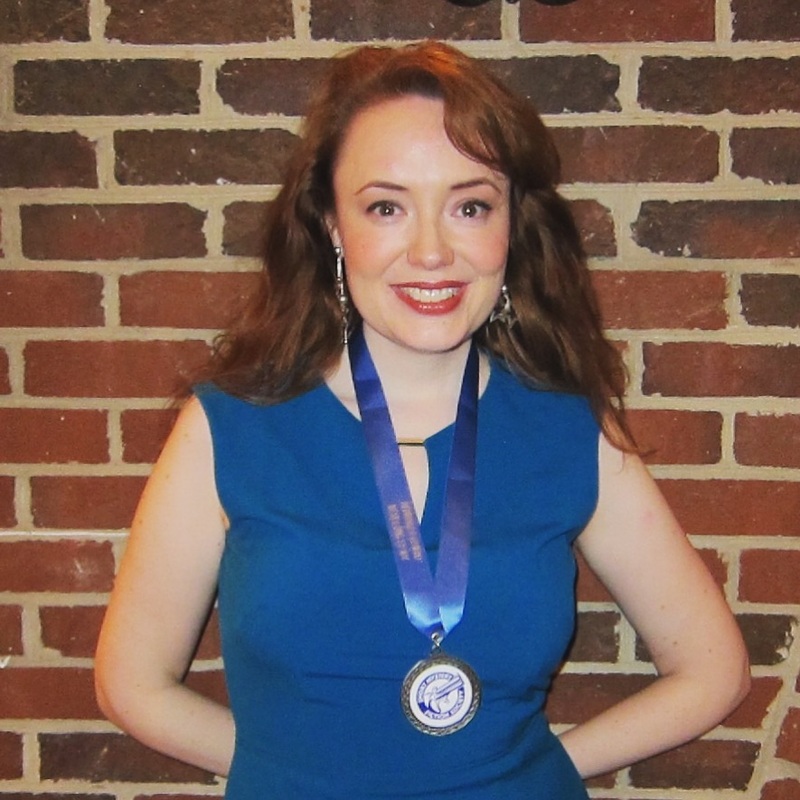 It was a terrific honor—certainly one of the greatest of my writing career—to receive this year’s Anthony Award for Best Short Story for “The Odds Are Against Us,” originally published in Ellery Queen’s Mystery Magazine. The odds were certainly against me as well with such a distinguished roster of other finalists—Barb Goffman, Craig Buck, Paul D. Marks, and John Shepphird—and I felt both surprised and privileged to learn that my tale had been chosen for the award. Throughout Bouchercon, it was also a thrill to catch up with so many old friends and make so many new ones—far too many in each case to list here! I still haven’t had a chance to reach out to all the writers and readers I met and whose cards and bookmarks are waiting for me to sort through, but I look forward to doing so soon—and to next year’s Bouchercon in New Orleans as well!